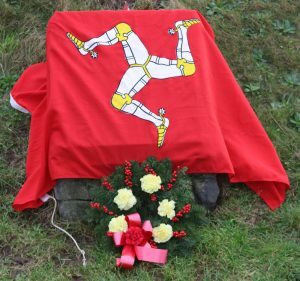 The annual ceremony commemorating the anniversary of the death of William Christian took place at Hango Hill, just outside Castletown, close to the site of both his execution and now demolished abode at Ronaldsway. 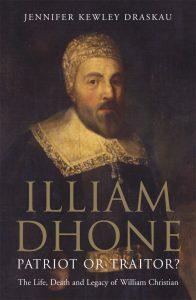 His death in the seventeenth century has long provoked comment and vitriol, with many still divided on the subject of whether he was a traitor or a patriot. 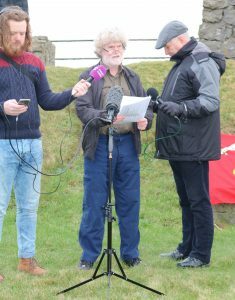 Jointly orga nised by Mec Vannin and the local branch of the Celtic League, the anniversary of Christian’s death also provides a platform for members of the community to enjoy the opportunity of free speech, as well as remembering the man nick-named Illiam Dhone (Brown-Haired William). 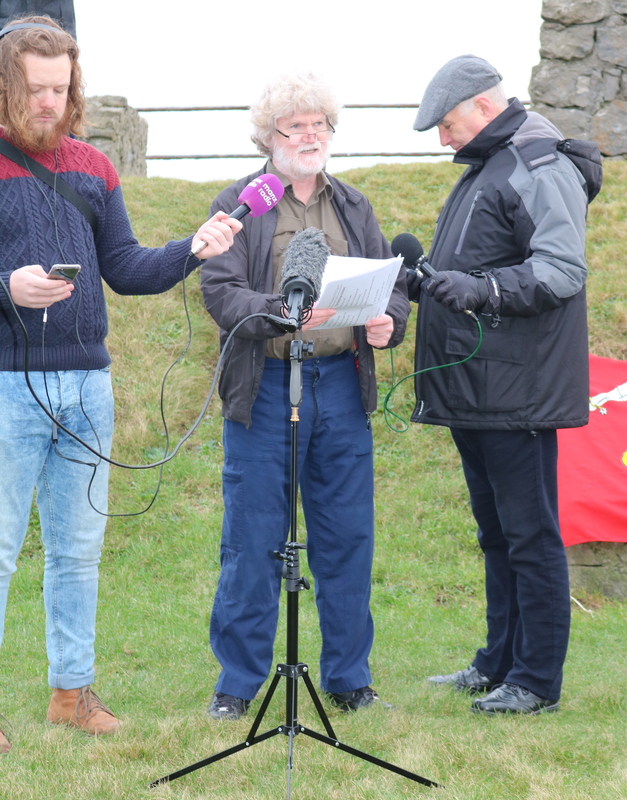 Introduced by Bernard Moffatt, the oration in Manx Gaelic was given by Chair of Mec Vannin, Mark Kermode, followed by a second in the English language by Bill Henderson MLC who spoke on the topic of the return of The Chronicles of Mann and the Isles to the Island. 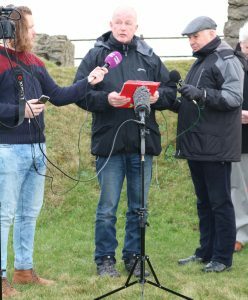 It’s an important, historical document, covering the early history of the Isle of Man and thought to have been written at Rushen Abbey in Ballasalla – although other historians suggest that the content may have been recorded at the Cistercian Abbey at Furness. But the main thrust of his speech focused upon a plea for the return of the publication from the British Library in England. 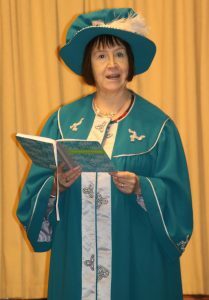 Back in 2007 he invoked a Resolution in Tynwald for the return of the Chronicles, but has lately detected further interest about the subject from his fellow members of the legislature. 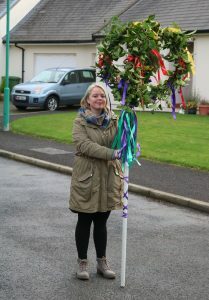 This was followed by the annual wreath-laying ceremony and singing of the Manx National Anthem in both Manx and English. 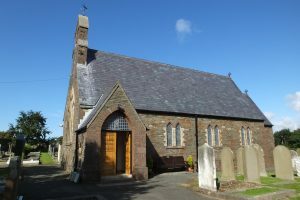 Once the crowd dispersed, there was an opportunity to either attend a special service at Malew Parish Church (where Christian is believed to be buried), or travel back into Castletown for a post music session at Compton Vaults, where hot soup was available in return for a donation to the Isle of Man Food Bank situated in Tromode. 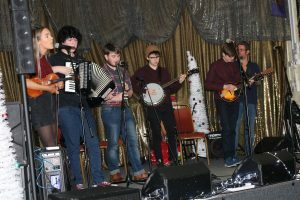 The Greater Washington Area Manx Society held its annual 12th Night celebration, beginning with a qualtagh chasing out the Old Year with a sword and bring gifts of salt, money and peat and ending with a rousing chorus of Auld Lang Syne. 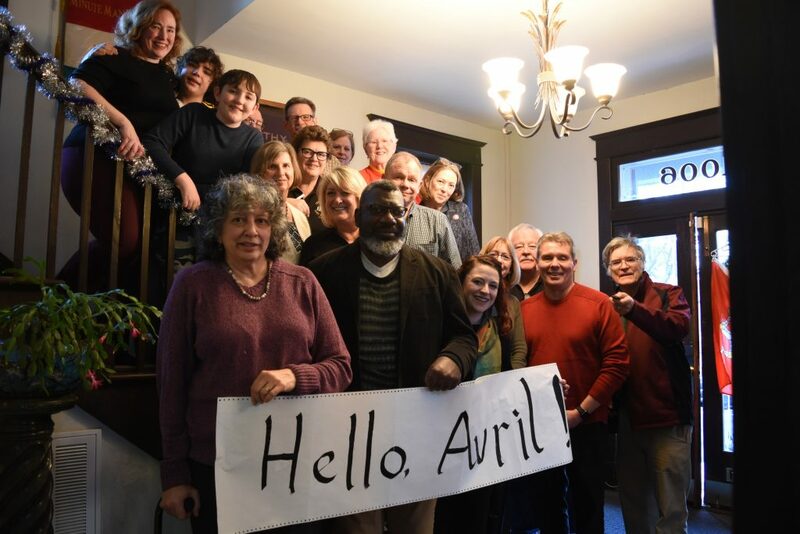 Here the Society poses with a sign for Avril Shipman, the Society’s surviving founding member who celebrated her 95th birthday last week. 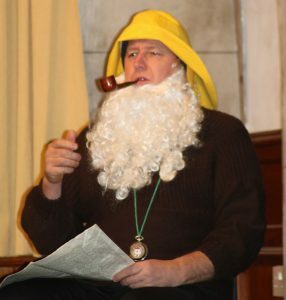 Other activities included a meeting to discuss events for 2019, announcing the NAMA 2020 plans for Plymouth, MA, and our rambunctious “Laxey Swap”. British overseas nations can now adopt the iconic 12-sided £1 coin. Overseas Territories and Crown Dependencies will, for the first time, be able to design and mint their own versions of the new 12-sided £1 coin. 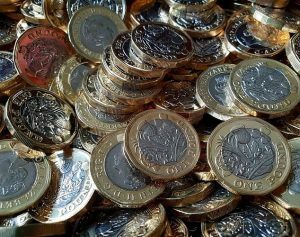 The iconic £1 coin has long been recognised around the world and Brits living in UK territories may soon be able to spend unique versions of the new pound, replacing the older coins currently in use. The coins are expected to feature images celebrating the heritage of these territories, with their history and culture pictured on the reverse side. Ministers believe this will symbolise the close links between the UK and its territories. The new £1 coin, introduced in 2017, is the most secure of its kind in the world. Many territories and dependencies have coins based on older versions of UK currency and they will now have the choice to use this cutting-edge technology and design to protect their cash. The Great British pound is internationally recognised and as we extend the new £1 coin to our territories and dependencies, we will see new designs emerge that together symbolise our shared history. This is an exciting opportunity for our currency to reflect the breadth and variety of the British Territories. Each will be able to create a design that reflects their own distinctive heritage as part of the British family. As well as helping to boost their identity, these new coins will also bring increased security to each of these economies. Features of the 12-sided £1 coin to thwart counterfeiters include intermittent milled edges and the denomination and year date incorporated in micro-text on the coin. The 2017 version replaced the round pound which had become vulnerable to sophisticated counterfeiters, with around one in every 30 in circulation repordedly being a dud. The old UK £1 coin remained legal tender until 15 October 2017, after which shops were under no obligation to accept it. The Treasury said the new versions of the coins replicated abroad are expected to feature images celebrating the heritage of the territories, with their history and culture pictured on the reverse side. 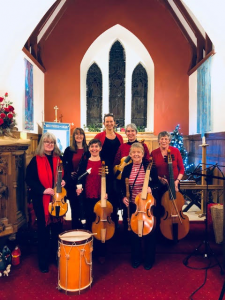 The much loved, annual Mollag Ghennal, which has its roots in the Garden Room of the old Villa Marina, before the Mollag Band took over the baton from the Calor Gas Ceili Band in 1993, celebrated its twenty fifth anniversary during the festive season. 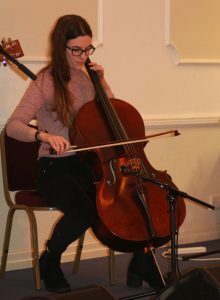 It’s a tried and trusted format still favoured by the event’s many followers, who enjoyed a relaxed evening of mostly local entertainment at the Manx Legion building in Douglas. 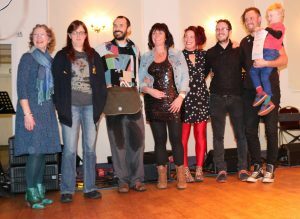 This year organisers welcomed Sel Edwards who provided both Welsh and Manx music, local singer/songwriter Matt Kelly, Imbolc (hotfoot from performances in Belgium), up-and-coming group Scran with their new album Nane, father and son duo Frank and Jamie Joughin and Manx dancers Skeddan Jiarg. 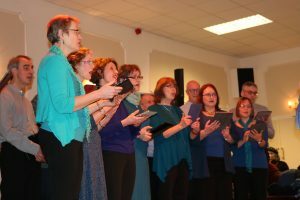 Meanwhile, the Mollag Band presented a new dimension, described by lead vocalist Greg Joughin as the musical equivalent of modern art, with groups of lyrics connected simply by vague association. 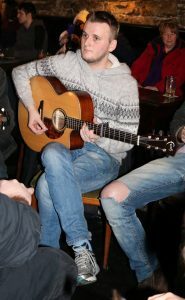 An abstract image formed through the ears of the listener, a kind of melodic Matisse. 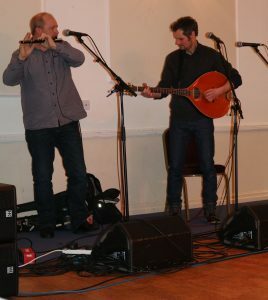 Supper was provided by the Mollag Kitchens. 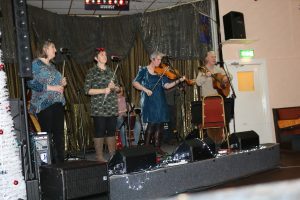 As well as the usual self-penned, original songs from the Mollag Band, the evening concluded with a revolutionary mix of community singing linking Victorian music hall and Manx folk classics from the 1970s. We’re off to Plymouth, MA for our 2020 Convention. 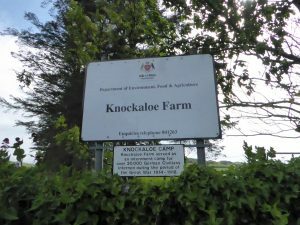 We’ll celebrate our Manx heritage in the place where Miles Standish, reputedly from Ramsey, was Captain of the Militia for the Pilgrims, in charge of their safety. 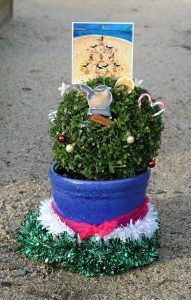 Put it in your calendars now! August 6-9th 2020. More information to follow. 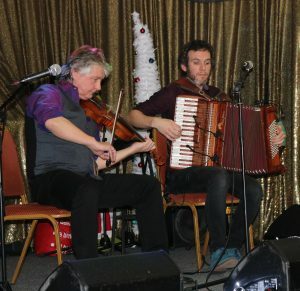 It’s a busy time for those keeping Manx traditions in the spotlight on the Isle of Man when St Stephen’s Day (Boxing Day) dawns, with a surge of interest in events this year providing a welcome boost for the future of these important occasions. 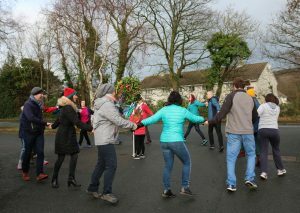 Hunt the Wren often includes many happy revellers from across the Island, ensuring that this long-held tradition remains unforgotten in an increasingly global climate. Fortunately the necessity of using a recently killed bird as traditionally required has been superseded by something less blood thirsty, with coloured ribbons replacing feathers of the bird for good luck as singers and dancers move freely amongst the villages and towns. 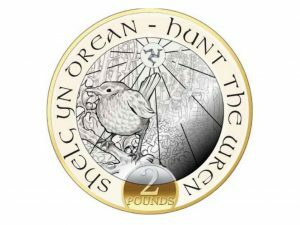 Additionally this year Isle of Man Stamps and Coins have also released a unique £2 coin capturing the striking image of the little wren, and available as either a single product within a protective wallet, or within a limited edition card featuring images from the recently produced Manx Folk Traditions stamp collection, a Hunt the Wren stamp and a unique first day issue postmark. 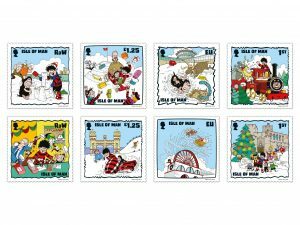 Meanwhile, there’s still an opportunity to enjoy the Island’s Christmas stamps celebrating eighty years of the Beano, with Dennis and Gnasher visiting several well-known destinations on the Isle of Man, drawn exclusively by their official artist Nigel Parkinson. 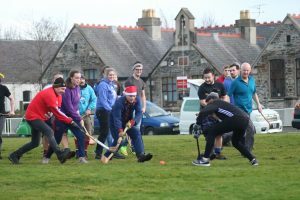 But later in the day there was a great opportunity to work off those extra calories by taking part in the annual Cammag match on the old fair field at St John’s, where teams from the north and the south battled for supremacy in a sport which may well be familiar to those in neighbouring Celtic nations who play shinty or hurling. 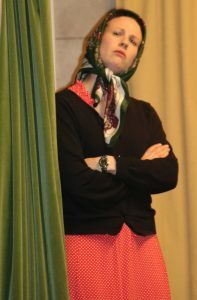 Although the game lost favour to football at the turn of the nineteenth century there has been a resurgence of interest in the sport in recent times. 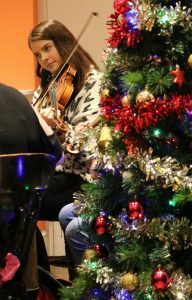 The day concluded with an uplifting music session in the Tynwald Inn which included some of the Island’s finest musicians. Add the sugar and saltanas. Beat the egg and buttermilk together and add to the mixture and beat well. 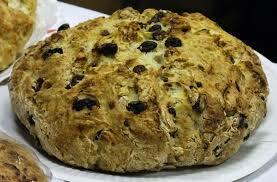 Shape into a round loaf shape and score a cross on the top. Bake in the oven for about an hour at 180°C. 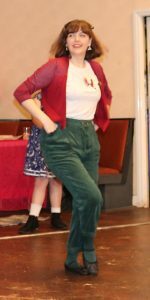 Want to know more about Bonnag?